“Working people are not going to take this lying down,” said Stephen Mittens, a Chicago-based investigator with the Illinois Department of Children and Family Services and a member of AFSCME Council 31. “Workers need unions more than ever” in an economy he says is “rigged” for the rich and powerful. The Janus decision means Illinois can no longer force public workers, including teachers, police and municipal and state government employees, who chose not to join unions, to pay “fair-share” fees that fund collective bargaining efforts. The decision took effect immediately, leaving workers free to hold on to more of their paychecks. But union leaders from AFSCME, the Illinois Federation of Teachers and the Associated Fire Fighters of Illinois said Monday they haven’t seen drops in their ranks. “I think we’ve all collectively done a good job of defining the Governor (Bruce Rauner) and his ambition to take away collective bargaining, take away protection for injured fire fighters, reduce retirement security. And because they see the hypocrisy in his attempting to portray himself as the champion for working people, they looked at this decision and said, ‘This isn’t right. This is going to weaken my position as a firefighter, a teacher, a state worker and therefore the union is right and I want to join them,’” AFFI President Pat Devaney said. He was among the union leaders who met with Congressional Democrats on Monday, including Illinois Reps. Jan Schakowsky, Brad Schneider and Raja Krishnamoorthi, as well as U.S. Democratic Whip Steny Hoyer of Maryland. Devaney says two firefighters who had previously been “fair-share” have instead asked to join AFFI in Janus’s wake. It’s too early to tell whether those anecdotes can be backed up. A spokesman for the state of Illinois’ Central Management Services said that the agency’s priority is to ensure that fair-share employees’ agency fees are being deducted from their checks. Only once that’s accomplished can the state provide a full accounting. Organizations that fought for the change, such as the Liberty Justice Center, will be watching to make sure that units of government implement the change correctly. Requiring all workers to proactively rejoin their union would be a huge burden for unions, and another way in which labor critics could effectively force union ranks to fall. Union leaders say they’re exploring other avenues, though that because they don’t have faith in favorable legislation passing with veto-proof majorities that would be needed to overcome a near-sure rejection from Rauner, no action is expected until after the 2018 election, in which Rauner is facing J.B. Pritkzer—a Democrat with strong union backing. Other heavily unionized states with Democratic majorities have or are in the process of passing laws in anticipation of, or in reaction to, Janus. Among them: measures to free unions from extending all benefits to non-members, measures that would make it easier for unions to recruit new members, and measures that would keep public employees’ contact information from non-union, outside entities. 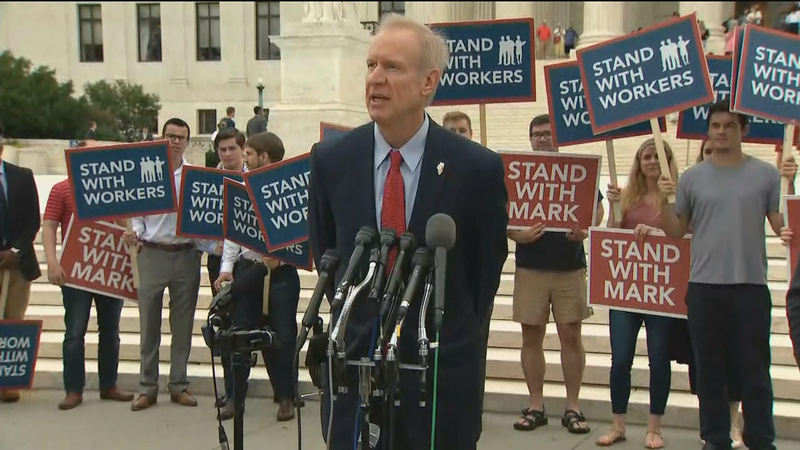 Organizations like the Illinois Policy Institute, which is allied with Rauner on union issues and is effectively the umbrella organization of the Liberty Justice Center, previously sent mail to workers following the Harris v. Quinn case, a precursor to the larger Janus decision, which gave workers freedom to stay out of a union. IFT President Dan Montgomery says teachers have already reported receiving calls encouraging them to drop out of the union. Broader dynamics are at play, which could impact even those with no direct affiliation to labor. Labor advocates point to research that shows that a steep decline in union membership will lead to lower wages across the board, even for those who aren’t in the public sector or trades. Weaker unions could also hit Democrats, labor’s traditional ally, at the ballot box—giving the GOP a long-term boost. Critics point to Illinois’ bleeding budget and staggering pension debt, and say that overly generous union contracts, doled out by lawmakers unions helped to elect, are to blame.